So, I just realized I actually have three paper dolls on the site all named Flora (one short run doll, one pixie paper doll and the regency doll) and I don’t even like the name Flora that much… I feel a little like a ditz as a result, but I don’t plan on letting it get to me too much. I mean, all ready pretty much have accepted that I’m a bit spacey (usually I try to blame this on a combination of work, school and everything else). 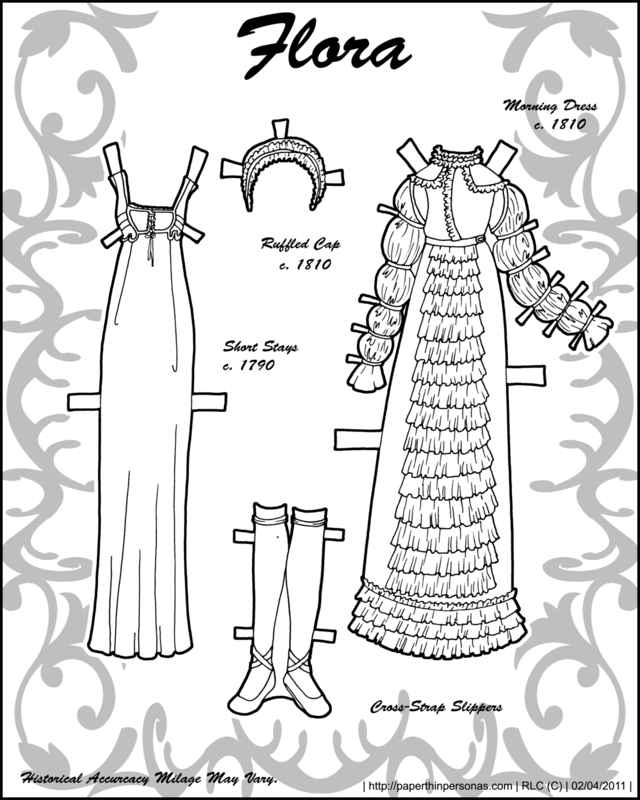 Today Flora (the Regency one) has a morning dress and a set of short stays. According to Ewing’s book Fashion in Underwear (which is being reprinted by Dover), the short stays were common through 1800 with this example I drew dating from 1790. There was a dramatic drop in the number of stays manufactures in the early 1800s. I always thought stays and corsets were distinctly different objects, but I have recently learned that, according to both Ewing and a few others, that the terms were used interchangeably for most of the 19th century before “corset” survived into the 20th and “stays” stayed (bad pun, I know) in the 19th century. Her morning dress is based on this illustration from the New York Public Library Digital Gallery which dates from and, of course, she has a cap to go with it. The morning dress was considered undress by the women of the era (there was also full dress and half dress) and was not usually worn outside of the house. It’s a beautiful garment though and the style of sleeve was called the “Juliet Sleeve” which I think is rather romantic and also.. um… does not bode well for the person wearing it. I would enter for just about any prize, even an icky one, cause how would you get it to me? But any prize you offer would hopefully be spiffy, and related to paper dolls or books. Not enough contests offer books as prizes, otherwise I’d probably enter more of them. i have been away on account of no internet (and that’s a huge drag), but it’s really nice to stop in and see so much new work! i am picturing this one with pale green trim. I’m glad you like Flora, Boots, since I know how you feel about paper dolls based on dolls :). I’ve been trying to not miss a post by working pretty far in advance. Which seems to be going well, but I don’t want to be too confident in case I jinx myself. Flora is my new favourite!